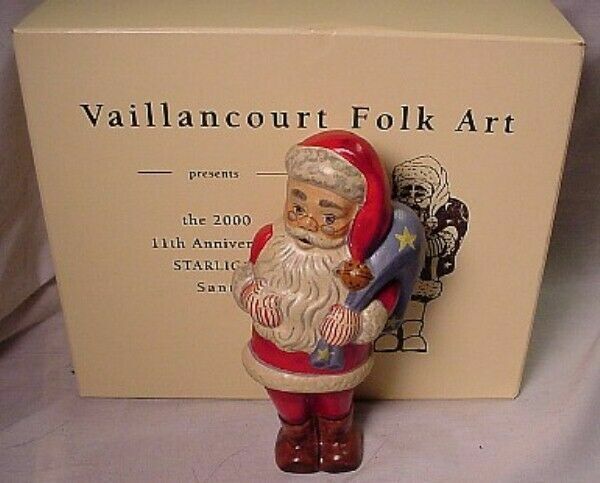 Vaillancourt Folk Art 11TH Starlight Santa in Box Retired! Vaillancourt Folk Art, Starlight Santa 11th year, no. 2000 - 30 - #1007. Signed by Judi Vaillancourt and in a nice gift box . It is one of a limited number of Santa's creative each year with some of the proceeds going to the Starlight Foundation. The first starlight along with the others have increased in value each year and make a nice collection to bring out each year or the entire year. They are all unique and very charming. This one is made from a Hornlein chocolate mould from Schawabisch , Gmund. He stands 7 1/4 inches tall and is in perfect condition.AS ALWAYS YOUR SATISFACTION IS 100% GUARANTEED!